ASKO Craft OvenAs Australian households evolved, high-end kitchens became expansive and opulent spaces that most of us can only dream about. Smaller homes were left without room for creating culinary output to satisfy diverse family needs, and fast food or takeaways became the alternative meal of choice. Soaring home values added to the squeeze, and unit and townhouse living became the only viable option for many first home buyers. 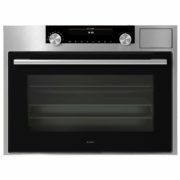 As a need was created, it has been filled by the ASKO OCS8487S Craft Oven, providing optimum cooking potential for kitchens of every size, including multi-unit and inner-city dwellings. Craft products are known for their independent, progressive streak, attracting individuals who want to experience greater quality control and personalised results. Craft ovens are no exception, and the OCS8487S has the capacity to become a genuine kitchen assistant providing customised suggestions and consistent results even for inexperienced cooks. We can’t all be masterchefs, but with an ASKO OCS8487S Craft Oven you have your own masterchef on standby, ready to help create new and delicious meals.